In my first book The Kashmir Shawl and its Indo-French Influence (1986), I had established a system of four categories or periods if you will that I felt helped define and classify the multitude of shawl patterns. Control of Kashmir during its four hundred year history of kani weaving began with the Mughals; Afghans, Sikhs and Dogra followed in succession right up until what’s considered the demise of the Great Shawl industry, about 1880. In 2010 my second book came out, Woven Masterpieces of Sikh Heritage which delved much deeper into the evolution of style and the forces that shaped it under Maharaja Runjit Singh. In my work I argue that a special shawl style indigenous to the Punjab came about that was based not on or necessarily influenced by European shawls. A style that found its roots in the fertile soil of the Punjab, an art style nurtured by the Sikh Brotherhood of the Khalsa movement and an autonomous culture that was in many way not part of typical India but isolated in a region cordoned off from the rest of the subcontinent by very specific boundaries, the Sutlej River (cis-Sutlej) where one side was ruled by the British, the other, the Land of the Five Rivers, by the Sikhs under Runjit Singh. Nevertheless despite my work in this area, a few textile experts have expressed doubts. They feel that the Sikh style derived from European Jacquard woven shawls that had been designed by French artists; moreover, that most of the basic designs evolved before the Sikhs took political control of the Kashmir Valley. In this essay my aim is to demonstrate the fallacy of this belief. During the late 1820s and early 1830s in the Kashmir/Punjab region of Northern India a certain strain of bizarre patterns began appearing on the kani woven Kashmir shawl. This curious strain comprised geometric shapes of sweeping curves and arches, architectural devices that resembled indistinct buildings, blossom arrangements of pyrotechnic-like displays, skeletal botehs (paisleys) and stars and lobed circles indented with spear-like tree devices, recurve bows, quivers filled with arrows, shields, boats, and even daggers, to name a few. 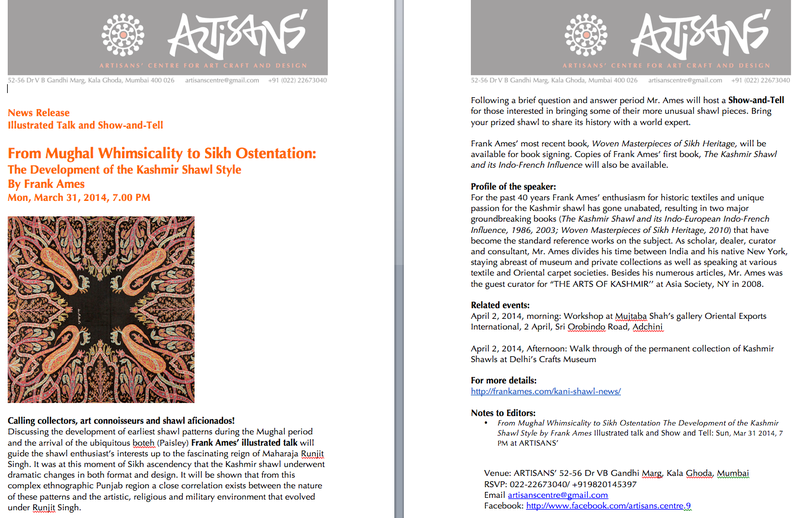 The confluence of these design ideas woven into the kani shawl is what I call in my publications the Sikh Kashmir shawl. Looking at the patterns, however, one’s opinion can only be drawn to a stark non plus since although the patterns are frequently awesome and majestic there is nothing inherent in their designs that could be equated with contemporary shawl designs being jacquard-woven in Europe. In fact, it is extremely difficult to equate them with any earlier form of known artist style or movement. The patterns are truly unique. However and despite any proof, there remain a few skeptics who refuse to align themselves with this train of thought. 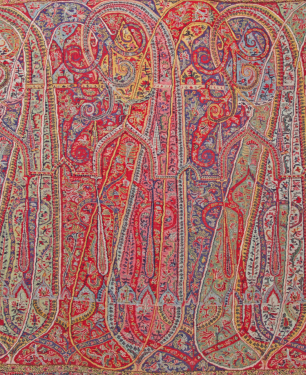 Their contention is that they see European influence as the driving force behind these bizarre patterns, that somehow Kashmiri artists were being exposed to shawl designs such as those being wrought by the well-known French industrial designer like Amedée Couder, or for example the Parisian manufacturers Bournbonet and Chambellan&Duché, and had set about copying them into their kani weavings in Srinagar. But the European designs of the 1830s that illustrated architecture were also extremely fresh and new to the market. In fact, so novel were they that extremely few have ever been found. 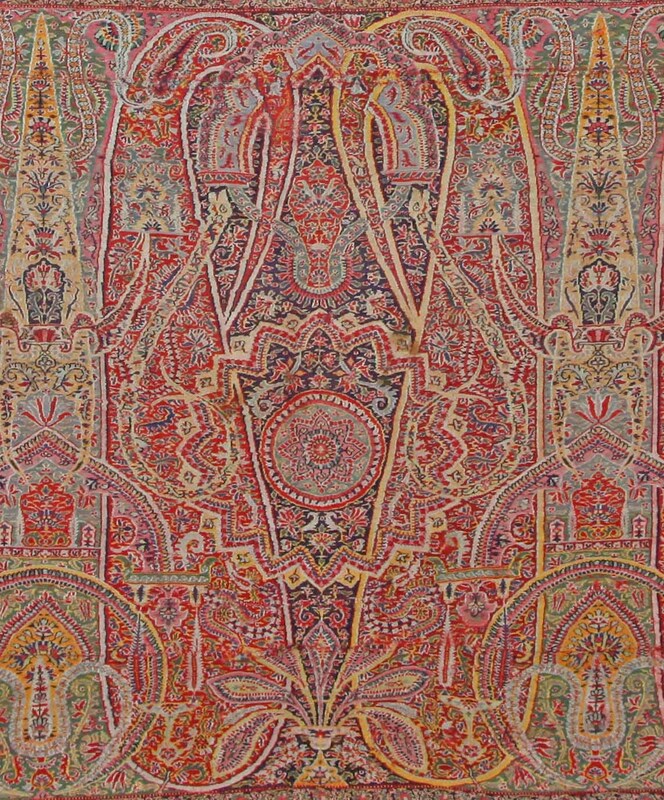 On the other hand, Couder’s Ottoman or Byzantine style Isfahan shawl of 1834 was frequently found woven as well as related patterns that imitated it to some degree. Bournhonet’s Gothic shawl ideas didn’t make it into ‘print’ so to speak until 1839(see p. 80 of MLS). All this to say that if these Gothic architectural designs were indeed so popular as the skeptics imply, then why is it that not one Indian Kashmir shawl has ever been found with a replication of these patterns for the Western market? As a concession to the skeptics argument I will concede that it’s not impossible that a few of these Gothic Jacquard shawls had traveled to Kashmir where upon the local artists, not understanding the complexity of the designs nor the social implications of the church-like architectural structures, set about creating their own “Gothic” style. But wait: The skeptics continue to decry that these “Sikh” period shawls were for export! So here lies the fallacy of their argument. Export markets exist only if there is a demand. Again, we ask: From where did the skeptics derive their information and on what grounds do they support their argument? Another concession I’ll grant but one that has no little bearing on design is the format of the shawl. For sure the demand for a larger wider long shawl compelled the Kashmiris to make theirs bigger. But back to the main argument. These particular European designs of building façades were Gothic in nature ( known as ‘renaissance’ shawl in France) and our knowledge of them is derived solely from a few illustrations in a French publication, ALBUM DU CACHMIRIEN BY F. Chavant, and an exceptional woven example (V&A, no. T.362-1980, see p. 81 of M. L-S). Except for Couder’s Isfahan (Bizantine style, 1834) and his famous ‘Nou Rouz’ (Gothic style, 1839), shawls which have been often found Jacquard woven, Bournbonet and Chambellan&Duché’s Gothic shawl designs are known only extremely rarely. The Isfahan of course is the earliest shawl exhibiting strong architectural elements; and many related shawls – invariably square shawls and almost all from the Couder atelier-are known. Their patterns exhibit an elaborate baroque style leaning more towards ecclesiastic Byzantium and far removed from any of the known bizarre (Sikh) patterns coming out of India. In my forty years as a Kashmir shawl dealer half of which were spent living in Paris and my constant travels throughout Europe and India and my frequent contact with the best collections in the world as well as buying and selling thousands of fine pieces, I have never seen a Kashmir shawl pattern based on any of the architectonic French models. And the reason for this? NO EUROPEAN DEMAND. Monique Lèvi-Strauss herself admits that the vogue for these ‘renaissance’ shawls was short lived. Furthermore, on the flip side, I have never seen any European shawl exhibiting the Sikh motifs in question indigenous to Kashmir of this period, except for those which were exact duplicates –of which many can be found- of those kani woven in Kashmir. 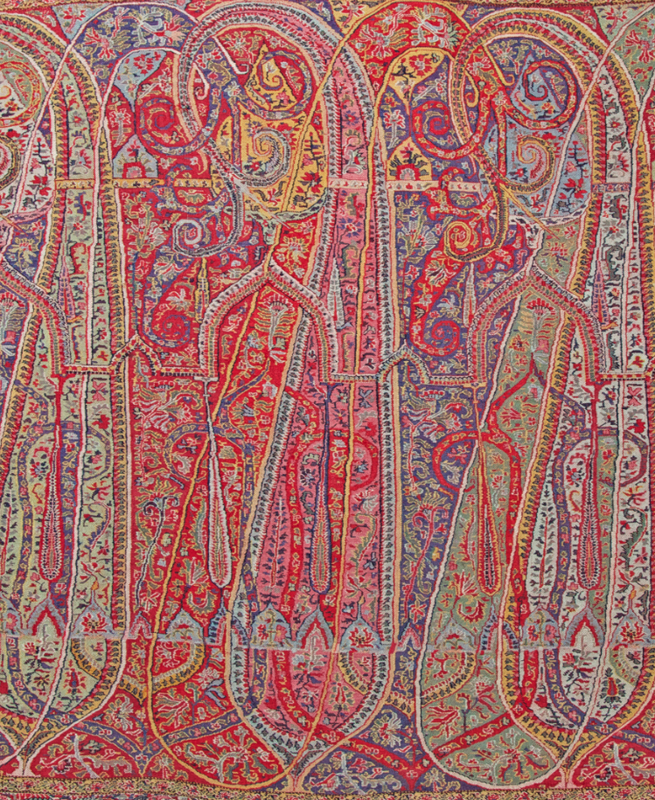 The skeptics contend furthermore that since none of these bizarre patterns can be found in contemporary painting, either in India or in Europe, the source of their design must have come from abroad and not India. It’s true that there’s not one known Indian painting that illustrates a Sikh shawl. But this cannot be taken as a measure of its lack of popularity. The Hungarian painter, August Schoefft, in his monumental painting of the court durbar of Maharaja Runjit Singh illustrates very clearly two long Sikh Kashmir shawls employed a curtains in this highly animated scene. Indian artists were not likely to paint a strange new fashion, one insular to a region cut off from the rest of India. Let me point out one important thing. The Sikh designs we are talking about here represent a an extremely narrow segment of a shawl industry known for a seemingly boundless repertoire of shawl designs. One might describe it as a very special artistic movement, albeit short lived, but perhaps not unlike the movements of Cubism or fauvism, both of which had only brief periods of popularity. And like these French movements, the Sikh movement also had its impact on future shawl style. There are not that many archival sources or references to French patterns of the early 19th century. 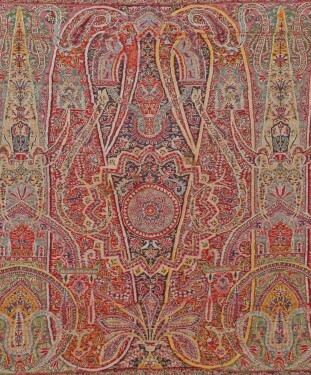 Besides Couder’s 1823 sketch of a long shawl that shows the seminal beginnings of a miner architectural device such as the running pattern around the shawl’s center field, of tiny mihrabs, there are also the sketches to be found in Chavant’s publications of shawl designs wherein we find a Gothic design done in pashmina by the manufacturer Bournbonet and another one exhibiting a type of Byzantine architecture layered with an overall feeling of Chinoiserie. Both shawls had been exhibited at the Exposition des produits de l’industrie Francaise of 1839. Monique Lévi-Strauss’ book, illustrates from “Souvenir de l’Exposition de 1839” from the shawl manufacturers Chambellan and Duché, a quarter section sketch of a square shawl, half painted in, of what is clearly and stylistically an already sophisticated Sikh pattern (p166) drawn directly from an imported Kashmir shawl.From the same album, Frédéric Hébert & Co, shows stylistically, a very similar pattern (p207), though featuring a peacock. Not only were both patterns obviously taken directly from Indian shawls, but Lévi-Strauss points out herself (p202) that “The only Hébert design not inspired by Indian models was the shawl known as The Dendera. And this is quite true of just about all shawl manufacturers who had to satisfy an extremely demanding market where competition was fierce. Fashion conscious clients would not accept anything that wasn’t truly Indian in style or nature. Now the question arises: Did the French have agents stationed in Kashmir, at the ready, to capture such patterns in kani weaving for the French market? And if they did why is it that no such shawls (either Byzantine or Gothic in style) have ever been found in the market? I have yet to come across a kani shawl exhibiting any such pattern. It is possible to speculate that the Kashmiri weavers, having seen such Baroque European shawls with their fancy architectural devices, scratched their heads and decided that this was too bizarre, instead they set about doing their own cultural thing and taking ideas from their homeland, the Punjab, the Sikh Brotherhood, the Khalsa, etc. The Sikh Punjab was not part of India. It was an autonomous region rule by a great Maharaja. The region did not follow in the footsteps of an India which was not yet a nation! My belief is that these patterns were the creative and exclusive products of a group of very talented Kashmiri/Punjabi artists who drew their inspiration from their own culture, their land, their religion, where they lived and the social environment that formed their outlook on life. The list of items mentioned above all point to this. I invite comments to this essay. Please go to “Contact” on the main menu. Recently a knowledgeable client of mine requested some not-so-often-asked-for details of an interesting Sikh period long shawl I have ( see no. 163 under Kashmiri Shawls). To find the answers, which I must admit baffled me at the time, required some serious hands and knees investigation into the exact piecing of the shawl. Close inspection of the fringes revealed something remarkable which I hadn’t seen on any other shawl. In my ‘fringe’ experience over the past 35 years I’ve always seen the classic solid-color tabs of the Sikh shawl sewn on to the pallus of the kani weave. However, here I discovered a very unusual, if not exciting anomaly: each of the tab colors had been inserted as an extension of the weave. If you’ve ever lent serious attention to many of the seamed classic dochallas, or long plain-field shawls that were popular until about 1830 you’ll often see how they were ‘invisibly’ pieced together by enmeshing the warps of one half with the other. It’s an absolute miracle how this was done; today, a lost art. This is the exactly the same process employed in attaching these tabs. Another question had me comparing the piecing of one end (pallu) of the shawl to the end. One side was 3 inches shorter that the other with Paisley heights differing by 2 inches. But overall of course the shawl otherwise doesn’t in the least appear unbalanced since any difference was made up by the sizes of the two kani panels comprising the pallus, which measure approx. 12 and 24 inches each. So how many pieces of kani shawl did the rafugar actually get before he pieced the whole thing together? The red center woven with its ‘door’ or edge-running pattern is one; the long-running side pieces flanking the center make two; the two kani panels making up the pallus at each end make four; the two long hashias (with white silk warps) make two. Nine kani woven pieces altogether not counting the plain woven fringe tabs. This should be the right count for finely woven Sikh period shawls. One should bare in mind that Sikh shawls predate the patchwork kani products by at least a generation. Knowing how a shawl is pieced together is of fundamental importance in learning about its manufacture and aesthetic qualities as well, and in the process of studying it along these lines there will invariably be interesting things to discover. I cannot stress how important it is to compare one end of a shawl to the other, noting the use of different colored threads, variations in design and rarely but sometimes a completely different flower might show up. This goes for all shawls be they Mughal, Afghan, Sikh or Dogra. It all boils down to taking a serious look into shawl construction.